Dogs were created to be man's best friend, and our closest pet. Dogs have a very loyal and loving nature and Pitbulls are no exception. Although there is an unfair opinion that they are cruel, Pitbulls are one of the fiendliest breeds. Pitbulls do not suffer from ego problems and always strive to shower their master and family with love and affection. Despite this fact, Pits are looking for a leader, but usually this is the same person. Wagging the tail. You may not believe it, but dog specialists have proved that a dog's tail can say a lot about his mood. 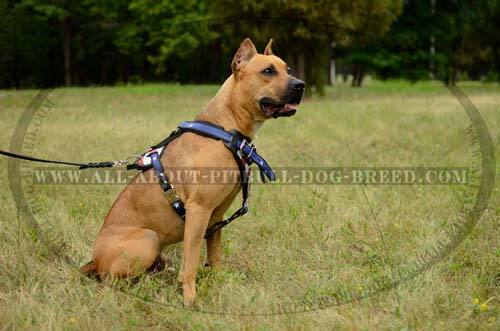 If you see that your Pit raises his tail and keeps it straight, that means that he is alert and full of energy. If your pet sticks his tail between the legs, that shows that he is scared. When you come back home and see your Pittie wagging his tail, this is the indication of his good mood and excitement. The signs of your Pitbull's satisfaction may be whining and whimpering. Licking. It is not a secret that all dogs lick their masters. The reason dogs lick is because their parents lick them when they are puppies to keep them clean and secure. There is an opinion that some Pitbulls lick because they want to secure their owners and want to show them that they are always around. Does your Pitbull do so? Then he is really loyal and loving. Following you everywhere. Does your Pitbull happen to follow you everywhere? Have you ever thought of a reason why he acts so? He does so in order to show you that he is always ready to protect you. Some handlers believe that following a master may be the sign of anxiety for an owner. If your Pitbull is sometimes stubborn and disobeient, his following you may help instill some discipline. If you see that your Pit wags his tail, or licks you, or follows you, that means that he cares about you. 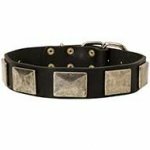 Do you want your great Pitbull to be always gorgeous and stylish? Want him to be a focus of attention? It is easy to do when corresponding dress is worn by him. Do not know where to take it? Do not believe most of producers? Yes, though dog market is spoilt for the choice of dog goods you are hardly able to find the article you really need. Most of this products are of low quality and ineffective in use. 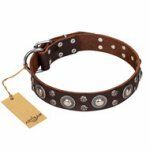 Now you should pay your attention to our recent invention-Handmade Leather Dog Collar Combining Best Qualities Those Being Longed For By Most Dog Handlers. 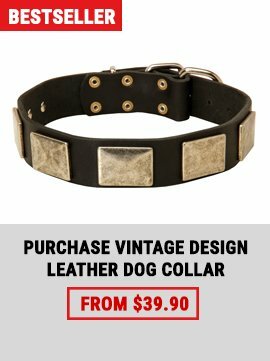 With this dog collar on your Pitbull will be best looking canine. 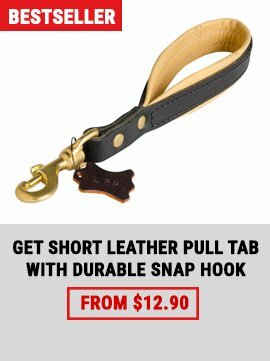 We sell today a custom made leather dog muzzle. 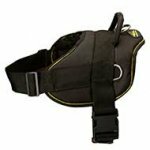 If you choose this professional dog muzzle you are sure to succeed in dog training even if you have never been a highly experienced dog trainer. 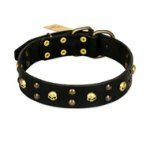 High quality dog muzzle is best muzzle for buying. 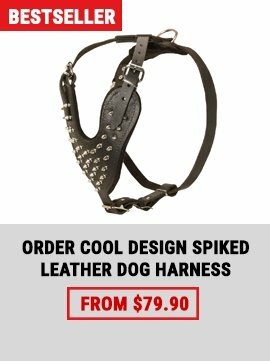 Spending not very big sum of money you get fully leather muzzle elaborately padded with Nappa leather for maximum comfort and to prevent rubbing. 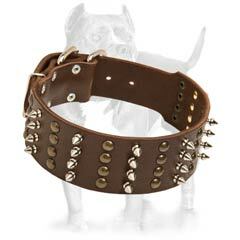 Show you dog off in this muzzle and every dog owner will not resist the temptation to inquire about this product. In addition, if a dog has to go to a groomer or the vet or a walk in the park, this muzzle is a good choice.